Cyclescape is a new facility to provide cycle campaign groups around the UK and their members with a toolkit for easy discussion and resolution of campaigning issues. It aims to make it easier for people to get involved, get up to speed on any issue facing cyclists, work more productively with Local Authorities, and discover best practices and case studies from around the UK. Geography is at the heart of the system. Is Cyclescape just another web forum? No. Although it provides a place for discussions, there's much more. For a start, everything is geographical, so you can mark on the map where a problem is, and people subscribe to discussions based on these locations. There's a library where you can pull in resources, e.g. guidance on 20mph limits for a discussion on that theme. 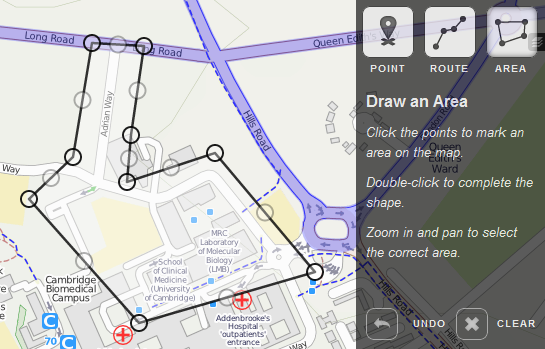 We've integrated collision data to help campaign on junctions. 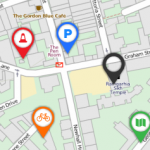 Planning applications will (shortly) be appearing on the map automatically. And you can use the system as an e-mail list as well as accessing it as a website. Firstly, you show on the map the places that you cycle in as 'my areas'. When someone marks a cycling issue on the map, you'll be subscribed to discussions on that if it matches your area. You can then discuss the issue and help bring about a solution to that problem. This quick guide points to the key features in Cyclescape and flags up the areas that aren’t quite complete yet. As it’s a ‘beta’, some things aren’t quite finished, or aren’t as user-friendly as they will be, and not all features are in place yet. However, there’s quite a lot that is! Go to http://www.cyclescape.org/ and create a free account using the ‘Sign up’ link (top-right). After filling in the quick form, you’ll be asked to check your e-mail to click on a link to confirm. If at any time you forget your password, click on ‘Sign in’ then ‘Forgot your password?’. Cyclescape tries to match the areas you cycle with issues in those areas, unlike an e-mail list where you can get lots of stuff you don't care about. So, once registered, you’ll be asked to add your locations. You’ll thus get subscribed to things in those places automatically. Click the small button at the end to save. Once you've added your locations, make sure you click on 'follow all existing threads' to subscribe to discussions that have already started. Cyclescape is primarily organised around campaigning within cycle campaign groups. So you need to add yourself to your area’s group. Your group will tell you where their page is. (There isn’t currently an automated listing of groups.) Cambridge Cycling Campaign, for instance is at http://camcycle.cyclescape.org/. On that page will is a button to join the group. Someone from the group will then confirm your membership. Always switch to your group, using the button in the top-right. When you’re within your group’s Cyclescape page, things are customised for that group, e.g. privacy settings, listings, etc. We’ll try to make the system to remember your group better in future. 5. Set your preferences – do you want to receive e-mails? Cyclescape can work like an e-mail list as well viewing things on the web. If you like, you can get messages on the discussion threads you’re subscribed by e-mail (as well as viewing them at any time online), and you can reply by replying to the e-mail in the normal way. To do this, go to your profile page (link in the top-right), and click ‘Edit My Preferences’. Your settings by default SUBSCRIBE you automatically to things in My Locations, and NOTIFY you of things elsewhere in your group’s area. You might want to help your group’s running (e.g. organising meetings) – there is a box for this. 6. You’re all set up now! You have an account, you’ve specified where you cycle (and other places), you’ve joined a group, and you’ve decided if you want to interact via e-mail also. There are various listings and ways of seeing information in Cyclescape. Deadlines, dates that have been set within the discussion threads you’re subscribed to. This is all the reported issues within the group’s geographical area. Each issue may have one or more discussion thread. List shows all the issues as a list, with a clear map for each. Most recent first. Map lets you browse them on a map, though at present they sometimes overlap badly. Popular is a new feature that shows issues according to votes received. Discussion threads are the actual discussions on an issue. Issue discussions shows the latest discussion threads going on, on any issue. Administrative discussions shows the latest admin discussions. These are not geographical and should only be used for things like organizing meetings. New administrative discussion thread lets you add a new administrative discussion. Give a description of the problem, and how it affects cyclists. Keep it brief: only a few lines at most. Keep it general: it could be used by other groups – don’t add lots of discussion – you can do that later in the context of your group. Once you’ve created an issue, others will be informed about it when it’s in their ‘My Locations’. You can reply to a discussion thread in your My Cyclescape area: just go in and reply. Or browse around the Issues area, and click on an issue. On the right of each issue (see screen below) shows any existing discussion threads - an issue may already have discussions going on. Click on any, thread and you can view and add a reply. If there aren’t any discussions yet, click ‘New thread ’ to start! When creating a new thread, you’ll be asked whether this thread is private to the group or not. Please respect the default setting for your group. You'll find that, over time, each issue page builds up to have a helpful archive of previous discussions, so newcomers can be brought right up-to-speed! 10. What else is there? Search - the search in the top-right will find issues, discussions on those issues, and library items. Library - is the place for resources that will come in useful, e.g. guidance on 20mph zones. These can be added to discussion threads later, and use ‘tags’ to match things up. Tags - these are the keywords that let you categorise things, and let the library work out suitable resources that might be useful. Collision data - on an issue page (like the picture just above), click on the little black icon on the right of the map to switch on collision data. Planning applications - these will soon appear as a listing so that you can upgrade any into an issue that can be discussed in the normal way. Feedback - in the top-right lets you report problems – we welcome feedback. Committee - the group membership contains some people who are set as Committee, who run the group. I chair a couple of local groups, how can I set these up? Also, how can I edit an issue that I set up?